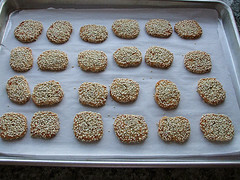 Sesame Biscuits made with butter, granulated sugar, egg, flour, baking powder and sesame seeds. Add beaten egg a little at a time to creamed mixture, beating well after each addition. Stir in flour gradually and mix well. Turn dough onto lightly floured surface and knead lightly. Form dough into small marble-sized balls and flatten with palms. Beat egg yolks lightly and brush each piece of dough with it. Place sesame seed on a flat plate. Press egg-yolk side of dough onto them so that a layer of sesame seeds sticks on. Place biscuits on lightly greased baking trays and glaze with egg white. Bake in a preheated oven at 350°F for 15 minutes or till golden brown. See Customer Reviews and Compare Bakeware sets . Cool on a wire tray. Serve or store in airtight containers.